Sometimes you may not be able to watch your favorite sports team live. Maybe you are still at work or at school, maybe you are on holiday, or in a country that does not show your team on television. The only option to view the game anyway is to resort to the Internet. We have covered several possibilities in the past, detailed in guides such as Watch TV Programs on PC or Watch Tv over Internet with Sopcast. The most common method is to use a software that uses P2P technologies to stream TV on the Internet. This does not necessarily mean that you can watch the game on a local channel that is streamed on the Internet. This means more often than not that you get commentary in a foreign language, which Chinese dominating the tv streaming world right now. Sport Player uses a slightly different angle to offer live streaming tv of sport events. Instead of being just another TV streaming application like Sopcast or TVUPlayer, it aims to combine multiple tv streaming programs in its interface. The name of the program hints at the second difference; Sport Player concentrates on sport events, and nothing else. Sport in this regard means football (that is soccer for you Americans), American football, Tennis, Basketball, Golf, Cycling, Cricket, Ice Hockey, Baseball and everything else that is popular. Sport Player is dominated by football right now, with virtually every European league available as well as Champions League, Euro League and national team games. When you start the application for the first time it displays three buttons on top and nothing else. The first thing that you want to do is to click the Update button to pull the current game list from the Internet. The interface is then populated with matches sorted by time, tournament and event. Tournament here means tournament or league, and event lists the teams that play against each other. A click on an event opens a new window that lists the available live streaming tv applications in a right sidebar. A click on any of them loads the tv stream in the main window. There is no need to download one of the applications which makes Sport Player a comfortable tv streaming solution. It is a good idea to switch to another available live streaming option if the selected does not offer a good streaming quality. Sometimes there is even more than one channel available by the same tv streaming program. It can happen that a link is not working properly, for instance if Flash Player is missing, the stream has technical problems or if the TV streaming software has updated its core engine and the developer's of Sport Player did not update their program yet to reflect those changes. The TV streaming window offers basic controls to change the volume and to pause or stop the stream. One interesting option of Sport Player is the ability to allow multiple sport streams at once. They are spawned in different windows then so that it is possible to watch multiple games on the same screen at once. 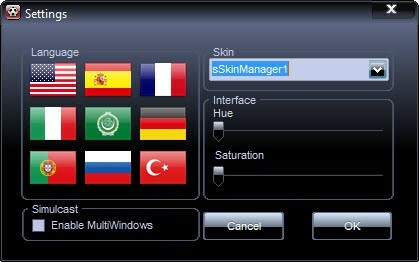 This option needs to be activated in the program settings. Sport Player is an excellent program for users who want to watch sport events on their computer. It is one - if not the - most comfortable solution to live stream TV sports. Especially the event listing makes it a breeze to find the interesting matches. Sport Player is available for download at the developer site. Thanks – this is great. I’m testing it now. Do you know if the timezone can be changed for your current location? I didn’t find a setting for it but thought maybe I was missing something. Nice piece of software. Great review. StormtrooprDave, Check !Online! events… links should appear, you can click on refresh button as well. Kim Woodbridge, as i understand its UTC +2 or UTC +3 time zone in program and it cannot be changed in this version. Guys, SportPlayer 6.0 has been released. New Explore feature allows browse about 100 sport channels! check sport-player official site for more information. Cheers!